I have a clothespin apron that I made. It's so much handier than a bag! I one that I bought over 15 years ago it was bundled with a package of clothes pins, and I have one that I bought a few years ago that is hand made with vintage wooden clothes pins that have a portion of wire wrapped around them. I bought the vintage bag to use as a pattern but so far it hasn't made it out of my kitchen. I use to hang my laundry. Had a coffee can with a wire bale on it(a hanger). Now when I hang clohes they don't smell fresh. i have a clothespin apron my mother made me 28 years ago when we got our first house. we had a clothes dryer but one of the first things we invested in was a clothesline. i've been drying my clothes outside ever since. i use our dryeronly when we are in a rainy period and there hasn't been a dry day in a week, and on emergencies. i love the sweet smell of clothes coming off the line. I too have an apron! I have a clothespin bag. It's old, but I don't know how old -- I bought it on Etsy. It came with its original clothespins. I love it! It hangs on the line and we just leave it out there. 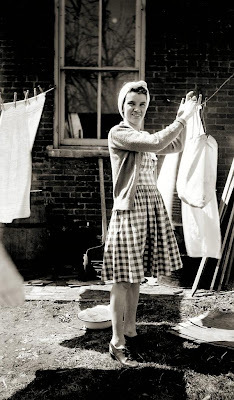 Patty, why don't you think the laundry smells nice when dried on the line anymore? I used to have a bag, but ot broke a few weeks ago, so I have been using a plastic Wal-Mart bag! I've been looking for a new one, but I like the idea of an apron!